How to disable the Audio Level OSD? 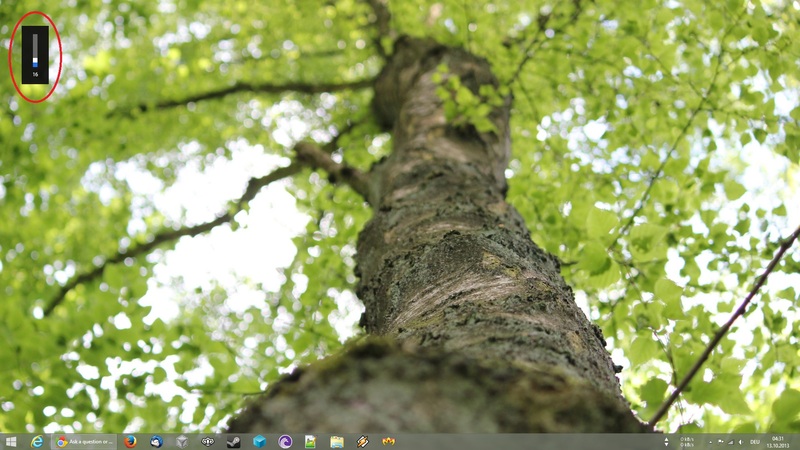 I've been using Windows 8 for some weeks now and i really like it but this overlay annoys me and i want it gone. Sadly i can't link or upload a picture of it, yet. PS: It is the build in OSD. It is a freeware program that lets you customize the Volume Indicator OSD. Sad that there is no other way. But this works just fine. Thanks to anyone for trying to help me with this. Based on my test,if I disable sound card driver,it doesn't appear. So,I suspect this issue is related to the sound card driver. I suggest you try to uninstall your sound card driver to test it. Also,please reinstall the latest version of sound card driver by laptop manufacturer website. Regarding how to disable it,I think it cannot be implemented. does this On Screen Display appear when you press a specific key? if so, what key or key combination is it? I suspect the overlay you are seeing, is related to a hardware-specific utility, provided by your hardware manufacturer, or a related audio utility application? what is the type/make/model of your computer? No, it is the Windows 8 Metro UI one. I have no other OSD Software installed. The second i have my account verified i'll post a picture of the OSD popup. Thank you, i'll do that now. 3. A window will appear. Now switch to "Start up" tab. 4.Search HPMediaSmart SmartMenu in the list and uncheck the tick mark. I appreciate your help but I repeat: It is NOT a third party OSD Software. It is Windows 8's Metro UI. Based on my research, the system volume widget is a system component. It is designed by default on laptop. Meanwhile, it only appears while using function key. I suggest you check if there are the keyboard shortcuts conflict. Please try the clean boot mode to test it. Also please check your keyboard, it is possible that some keys were stuck. It happens on a freshly installed Windows8 too. Even a different keyboard doesn't help. The popup appears always when the system volume is changed by the keyboards media keys. I simply want to know the registry entry to disable it. If that is not possible the name of the .dll or .exe which is responsible for the OSD. But sadly, that does not help in any way. BTW the problem exists on a desktop PC not a notebook/laptop. It is crazy that there is no way to disable or even move that damn thing. Why would anyone program such an annoying feature, without any options? I have come to the official Microsoft forums and not even here i can get a solution?! I would pay to get this thing removed. What setting did you made? How I get rid of that thing? While I watch Movies, I change the Volume often and every Time pops that annoying Overlay up. Days of customisation, I hate Windows 8 so much! Fixed issue when I had the same problem, pesky OSD volume slider, top left of screen. I also had a problem where right click menu failed to show. Problem solved - no OSD Volume slider in the top left corner, right click menu works again. * I suspect I can reinstall K-Lite Codec Pack Full Version and still be ok, so long as I don't install MPC. I had the same problem. To fix this I wrote a small utility, that hides the volume OSD.